The rates above may change. 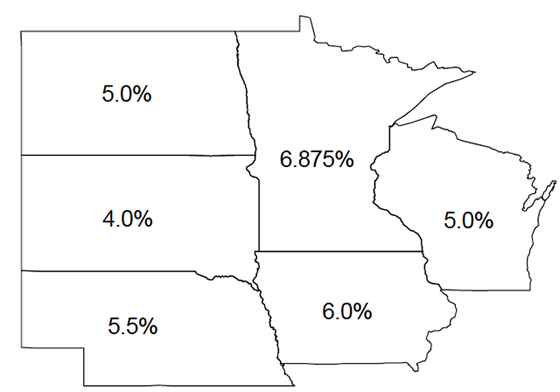 For current rates see State Sales Tax Sites for Video Producers. The fact is that every business must collect sales tax on taxable goods and services. Failure to do so could be a very expensive mistake. One possible consequence of getting caught is that they could make you pay sales tax for all the years you’ve been in business! What could you do? Go back and try to collect from all of those clients? Good luck. Determining whether or not to collect sales tax on video productions has frustrated many producers, myself included. We surely don’t want to break the law, but deciding what the law covers is not so easy. So you look it up on the your state’s sales tax website. No answer there, so you call someone in that office. No clear answer again! Surely your CPA will know. Surprise again. So, you call other video producers, but still get conflicting advice. It’s entirely your responsibility to know and obey the law so don’t take chances. One producer did all of the above and still had no clear guidance so he decided to charge all of his clients sales tax, unless they were an out-of-state client or had proof of tax exemption. His attitude was: if you are in my state, you MUST pay tax unless you can show me written proof why you shouldn’t. It’s the CYA approach and you can’t really blame him, but there must be a better way. Rules vary by state. Some states tax products but exempt services. Never assume this is so. And even within a state, the rules can be inconsistent or completely illogical. Sales tax is a trust fund tax, meaning that when you collect the taxes, you are doing so on behalf of the state, and you are required to turn this money back to the state in a timely manner. Alaska, Montana, New Hampshire, Oregon, and Delaware do not charge sales tax. So if you are a producer in one of those states, you can stop reading now. Just watch that they don’t change the laws. When you collect sales tax, some of your customers may say you can’t charge them sales tax because they aren’t the “end user.” This could be true if they were reselling your services to an end user. For instance if you were producing a commercial for an ad agency who is then charging their client, the agency theoretically would charge their client. But confusing the situation even more is the fact that advertising is exempt in some states. If you are making 200 DVDs for a client who is marking them up and selling them to the public, he needs to charge sales tax to his customers. But you would not charge sales tax in this case. Just make sure he has a resale certificate from the state. 1. Let’s determine if you need to collect sales tax in your state. The first step is to look for your state’s website for the department of revenue or whatever they chose to call it. You will find a complete list of them here. 2. Google “video producer collect sales tax YOURSTATE” without the quotes. This technique revealed that the state of Minnesota Tax Department has a fact sheet for video producers. It’s called Fact Sheet #169 which you can read here (http://www.revenue.state.mn.us/businesses/sut/factsheets/FS169.pdf). In those search results look carefully for state government sites. Your state may have published information about video production and taxes that you need to know. If the answer is yes, you need to register to collect sales tax in your state. In most states you can register, submit reports, and submit taxes due online. Visit the website of your state’s Department of Revenue and register for your sales tax permit. You will first need to have your Federal Employer ID Number and all of the information about your business and its owners. Apply for the Federal ID number here. Always get a valid reseller permit from anyone who says they do not have to pay tax. If they don’t provide this document, you will have to pay their tax. It is wise to inform your clients that there will be sales tax added to their bill before the job begins. No one likes those kinds of surprises. In addition to giving you the right to collect sales tax from your customers, this document may also allow you to avoid paying sales tax when you buy products you are re-selling such as blank DVDs or Blu Rays. However, equipment may not qualify. Ask your accountant. On the invoice or receipt you give to your customer, you must show the amount of sales tax separately. It’s a good idea to keep a running total of the tax collected so you know how much you owe. If you have a lot of sales volume, you may be required to pay the tax monthly. Otherwise, this is a quarterly chore. Your accountant may do it, but it is pretty simple bookkeeping. You may just want to save the accounting fees and do it yourself. Mark the sales tax due dates in your calendar so you don’t forget. There is a fine and/or penalty for late payment. Many, if not all, states allow you to file and pay sales taxes online. Some even give you a discount for prepaying sales taxes. Take advantage of this if you possibly can. It’s like making a small, extra profit on each sale. If you are selling DVDs or Blu Rays online, you are required to charge sales tax only for those customers in your state. The Supreme Court ruled in the 1992 Quill Corp. v. North Dakota case that merchants are only required to charge sales tax if the merchant has a physical presence like a building in that state. So if you are in just one state, you are only required to charge sales tax to customers who are also in that same state. You are not required to charge tax to customers in other states. In Massachusetts, if I deliver a tangible product, I.E. a DVD, then the total invoice is taxable. So, $995 for the shoot and $5 for the DVD is taxed at $1,000. If what I shoot is delivered over the web, no tax is due. Be aware that some states are beginning to tax digital products. I believe that pdf from Minnesota in the article above talked about taxing digital products. I’m an independent film maker just starting out. My wife and I would like to sell our first, low-budget indie film to family & friends. We live in MN, so according to the chart above, for every DVD I sell for $25, I need to pay roughly $1.72 (6.875% of 25), correct?